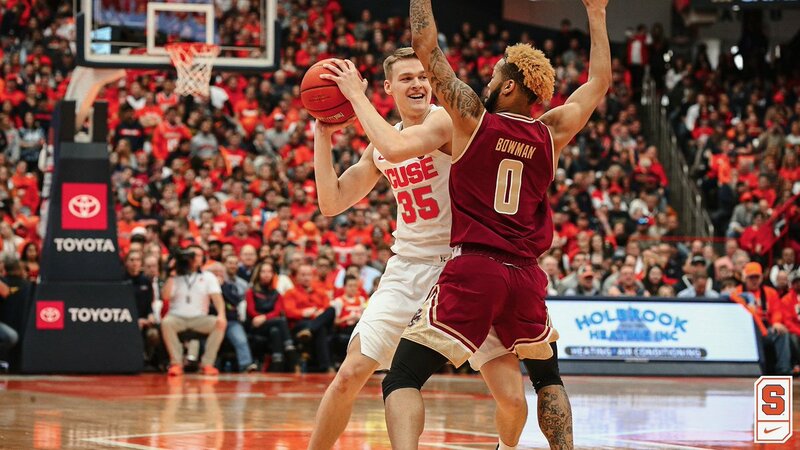 In front of the largest on campus crowd in college basketball this year, the Syracuse Orange (17-7, 8-3 ACC) used a strong defensive effort to ground the Boston College Eagles (11-11-, 2-8 ACC) Saturday afternoon at the Carrier Dome winning 67-56. On the offensive end, Tyus Battle led the Orange with a team high 21 points. Buddy Boeheim had a career high 16 points including four three-pointers. Oshae Brissett chipped in with a 12 point, 12 rebound double-double.